Our quilt show in 2016 was extra special because it marked our group's 20th anniversary. We invited former members to exhibit quilts, and were able to include a number of sampler quilts that were the first project the group did in 1996. Mayfair Presbyterian Church offered us a lovely setting for the quilts, samplers, knitted items and other hand made items displayed there. We had a great turnout by our members, and a large number of visitors. Our thanks to all the people who made this a successful show. Our next show will be in April 2018. 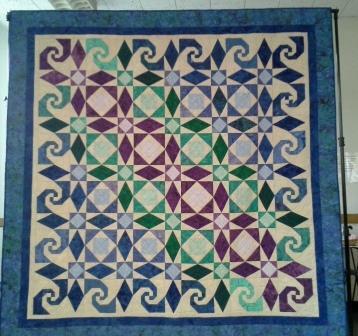 The raffle quilt was a group project, coordinated by Gail and Christine. It is a combination of two traditional blocks:Storm at Sea and Snail's Trail.